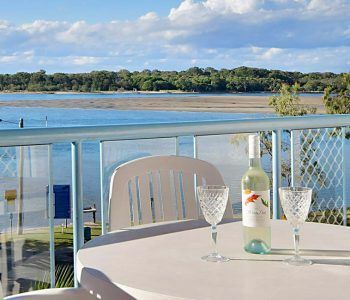 You’ll love these Maroochydore apartments with their wonderful river views. Make this one of your most memorable Sunshine Coast holidays yet at Reflections Holiday Apartments Maroochydore. Relax under the shade of the rooftop sailcloth and admire the beguilingly lovely views of the Maroochy River. Our one, two or three bedroom apartment all have options for guests to select the rooftop upgrade. On the rooftop you will find space to move and sun loungers to recline on, along with your private hot tub and BBQ. Our self contained apartments are equipped with all the mod cons, fully equipped kitchens, washer/dryers, air conditioning, Austar and wi-fi and are close to the Maroochydore shopping areas. Get all your provisions at the Big Top Market Fresh shopping centre. 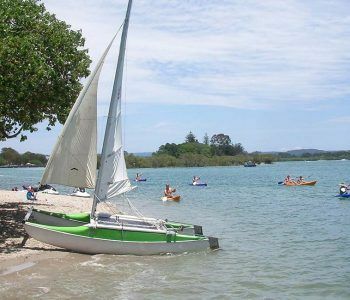 It couldn’t be more convenient with Woolworths and a food court that is handy for when you don’t feel like cooking during the day.In the evening you may wish to consider popping over to Cotton Tree to have a bite at The Boatshed. It’s a local favourite where the portions are generous and the decor relaxed — a celebration of everything Australia, the food, beach, cool sea breeze, sun, sand and cold crisp beverages. Don’t let this stop you from exploring the local cuisine scene. 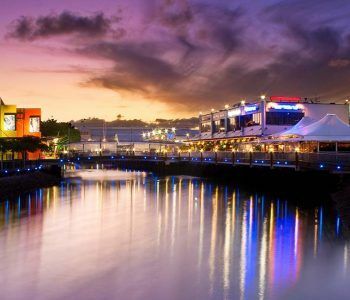 Along Duporth Avenue you’ll find several good eateries including the Ebb Waterfront Dining and Cellar if you’re looking for something special. Cotton Tree also has some good restaurants, but venture down to Mooloolaba and you’ll be drenched in choice for quality eating, although you should pick up some of Mooloolaba’s famous prawns while you’re there, and get the BBQ on the rooftop working. Mooloolaba makes for a very good day out too. Whether you enjoy long coastal walks or perhaps visiting Sea Life Sunshine Coast where you can see thousands of underwater creatures, including sharks, saw fish, seals, turtles, stingrays and tropical fish by walking underwater through the glass viewing tunnel. Sounds good right. Get yourself down to these Maroochydore apartments with their wonderful river views at Reflections Holiday Apartments. You’ll love those Mooloolaba prawns but they’re not going to cook themselves. Book now.